I have a number of the Spectrum 4-6-0's. I model the Tonopah and Tidewater RR and they had a number of locomotives with 62 inch drivers but with straight walkways and only 1 air pump. The low boiler model looks about right. It looks like a simple conversion but I was wondering if anyone has tried switching the superstructures on these frames, before I take a screw-driver to mine and try. If no one has, I'll give it a go and report back. Please report, I am very interested in the outcome. I did two this weekend. Worked very well. You need two longer screws for the rear and there is a small gap but it is barely visible and easily covered. Switch the dome, the cab and the smokebox door and you have a nice conversion with the straight walkway version on the 64 inch drivers. Looks much closer to the prototype I am modeling (Tonopah and Tidewater #9 and 10) The only problem is that one can not do the conversion without breaking something that you don't want to break. The only problem is that one can not do the conversion without breaking something that you don't want to break. The engine brake cylinders seem particularly prone to breaking off. The pipe coming off the generator broke. One of the wire connectors between the engine and the tender decided to come off. 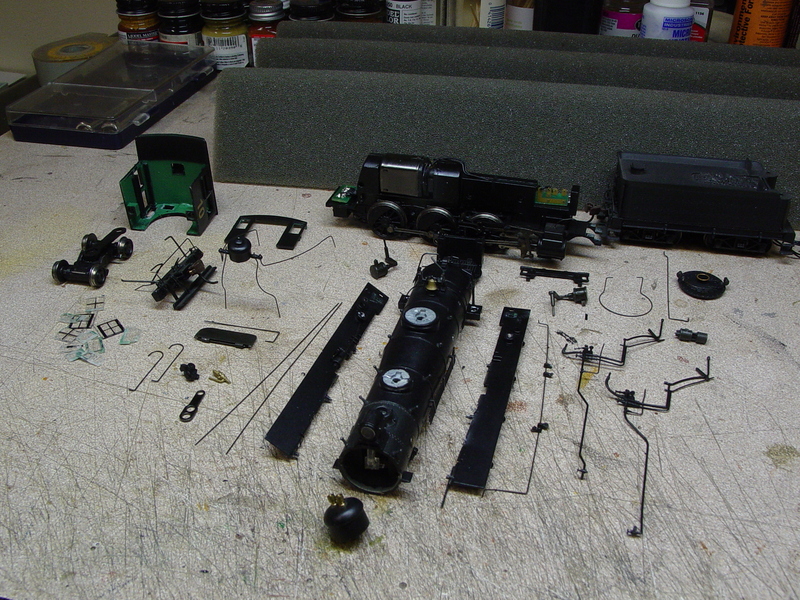 There was slight damage to one of the smokebox fronts while prying it off. Nothing that couldn't be fixed. The generator is a part that can be ordered, although it is listed under one of the 4-4-0’s. Nice detail but very fragile, I’ve lost several. Why did you remove the smokebox door? Headlight? Brake cylinders may be available separately, check. Glad you managed to cobble it back together. I can't say as I have ever had that sort of troubles with the 4-6-0. I found it way easier to take apart than the Climax models. Wow, you are a braver man than me! Useful photo. If I did that, I’d sneeze and put parts all over the room. There are brass detail parts available for items such as brake cylinders and generators. See the Cal-Scale line from Bowser, and PIA parts from Precision Scale, among others.